A CDV of C.T. 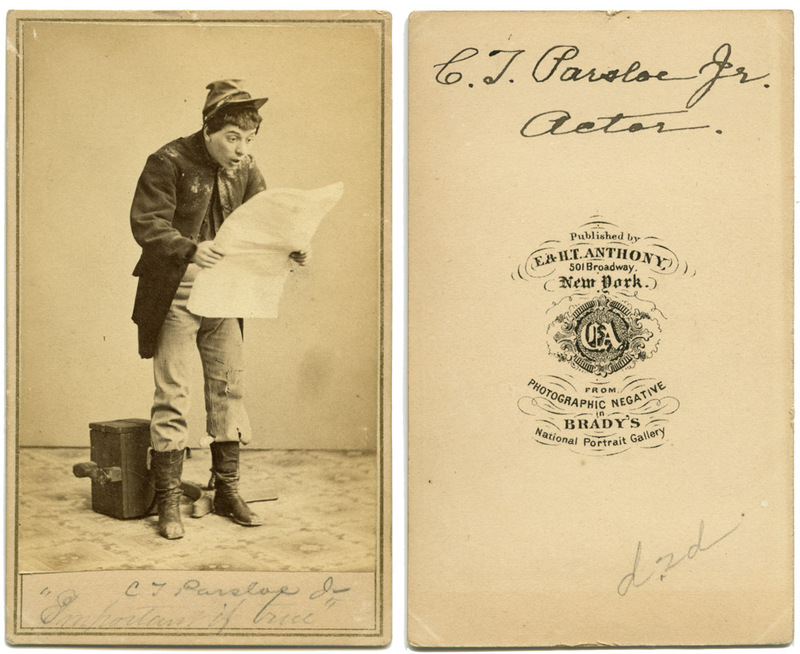 Parsloe Jr., a 19th century American comic actor. The pencil script on the bottom says “Important if true”. I love this image because it shows the power of photography to capture a fleeting moment of expression. This almost feels like it could be a still frame from a movie, unlike so much mid-19th century portrait photography where people are formally posed in elegant albeit highly conventional poses. It’s an image like this that shows Brady’s genius as a photographer – he was able, with 19th century wet-plate technology, to capture the essence of physical comedy. And you can still see the clamp stand behind Mr. Parsloe, which is a real testament to his power of posing, that he could do something so seemingly spontaneous while being physically restrained by the clamp! I just discovered the University of Washington’s archive of photos of 19th century actors – it’s a resource I will be returning to to look up more CDV images as I keep collecting. That’s great! You’re right, it’s an impressive feat to hold that pose and expression for a period of time long enough to require a posing stand. And thanks for sharing the link. That looks like a fun and useful archive.